An attendee to a workshop at The Barn once brought one of Konrad’s planes and the hook was planted. Over the years I’d given little thought to infill planes until more recently when my acquaintances with these plane makers, and more importantly experiencing the sublime quality of their tools and the results they imparted, encouraged me to explore a bit further. Rather than diving in whole hog for the price of a new Sauer&Steiner/Daed/Brese plane (none of them affordable to me no matter how hard I might dive) I did what I often do with new notions. I bought several old beaters at Martin Donnelly’s 2015 summer auction. Actually I bought three beaters at about $11 apiece, and one very fine c.1800 London infill miter plane that was a fair bit more than that. More about that one later. 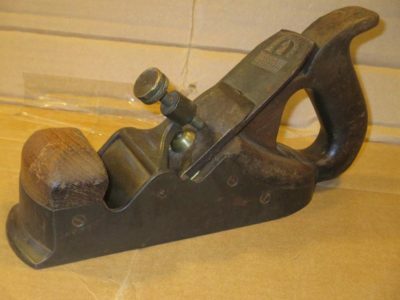 This intermittent series of blogs will address my reclamation of this group of planes, beginning with an unmarked D-handle smoothing plane of unknown vintage and origin. But it was complete and intact, bore no obvious scars of abuse or damage, and seemed a great starting point in this journey. Fortunately since this plane was complete though battered, the restoration — although transformation might be a better word since it bears little resemblance to its former self — took only a few hours spread out over several days and interspersed with other activities.